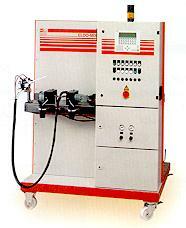 ELDO-MIX multi-component metering systems can process all polymers such as polyurethanes, silicones and epoxy resins. The ELDO-MIX is an electrically driven positive displacement gear metering system that is suitable for non-filled, non-abrasive, low to medium viscosity media. A special version of gear pumps is available for processing filled material applications. 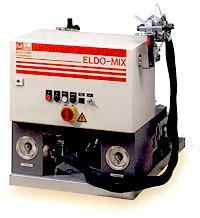 The ELDO-MIX series can obtain a wide range of mixing ratios and includes models that process more than two components simultaneously. The material delivery can be dispensed in a continuous flow or metered in a measured shot. The metering ratio is variable and selected via the electric motor speed and the metering pump selection.